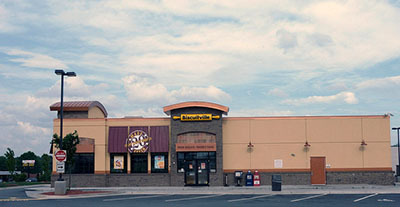 The Biscuitville franchise began in Graham, North Carolina in 1966 when baker Maurice Jennings opened Mountainbrook Fresh Bread and Milk stores. Noticing the increasing take-out pizza trend, the stores began selling fresh pizzas. By 1972 Jennings had opened 6 pizzerias in North Carolina and Southern Virginia, branded 'Pizzaville.' Noticing that there was little demand for pizza in the morning, Jennings began baking his family's secret recipe biscuits during the early hours for additional revenue. The biscuits began outselling the pizzas, and in 1975 Jennings opened his first biscuit-only store in Danville, Virginia. Eventually all Pizzaville locations were converted into Biscuitvilles, and by 1982 the company had 25 locations baking fresh biscuits every 15 mintues from 6 AM until 2 PM. Jennings' son Burney Jennings took leadership of the company in 1996. Corporate headquarters moved to Greensboro, North Carolina in 2007. In 2014 the company launched new branding and introduced their featuerd lunch menu. As of 2017, the company included 54 locations in North Carolina and Virgina. Garner, Bob. "Southern Comfort." Our State, July 2009. Accessed August 23, 2017. http://digital.ncdcr.gov/cdm/ref/collection/p16062coll18/id/91934. Biscuitville Wilksboro. Flickr user CP Thornton.